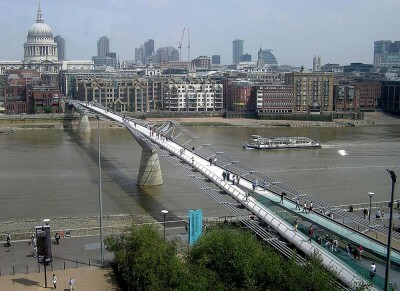 The Millennium Bridge is perhaps one of the most famous, as well as most visited bridges in the entire world. It is a steel suspension bridge that is not designed for vehicles to cross. Instead, the bridge is used by pedestrians who want to go over the Thames River. The bridge is 1,214 feet long, which makes it one of the longest bridges in England. The construction of the the Millennium Bridge started in 1996, and it opened to the public in 2000. However, the bridge was only opened up to the public for two days, and it reopened in 2002. The reason why the bridge was closed for two years is because the bridge was swaying. As matter of fact, the bridge used to be called the Wobbly Bridge by many people who live in London. The bridge’s south end is located right by the Globe Theatre, so if you plan on visiting the bridge, you may want to go and catch a show at the Globe. When walking across the bridge make sure to bring a camera and check out the views of the river from above. You will also get a great view of London’s skyline. After walking on the bridge, many people will enjoy some fine dining located in the area of the bridge. If you wish to do some shopping, then you are in luck, because there are a handful of shops that are located on both sides of the bridge. The bridge is accessible from both sides of the River Thames, so you can drive and park your vehicle on either side of the river, but you may have to pay a fee in order to park. There is also a train station located near the bridge on both sides. You can also choose to take a public bus, as there are a few bus stops that are near both sides of the bridge. It does not cost any money at all to walk across the bridge, and it is open to the public all-year round, so regardless of the time of year you go to London, one can visit the Millennium Bridge.